Gil Rose will lead BMOP with soloists Sarah Pelletier (soprano, St. Teresa I), Gigi Mitchell-Velasco (contralto, St. Teresa I), Deborah Selig (soprano, St. Settlement), Aaron Engebreth (baritone, St. Ignatius), Charles Blandy (tenor, St. Chavez), Tom McNichols (bass, Compere), and Lynn Torgove (mezzo-soprano, Commere). BMInt’s Joseph E. Morgan interviewed Charles Fussell, vice-president of the Virgil Thomson Foundation by email. Morgan: Can you describe Thomson’s position in the history of music and how his particular compositional voice relates to the modernist movement—or perhaps his impact on American music? Fusell: Thomson is one of the early founders of the American minimalist school. A European counterpart would be Carl Orff. Plus he, with Copland and others, used American folk tunes in not only film scores but symphonic works to create a lean, clear textured style that would become associated with American music. Even jazz rhythms. 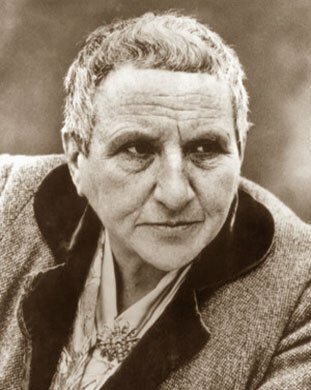 How well did Gertrude Stein and Thomson know each other? He read “Tender Buttons” at Harvard, looked her up in Paris, became good friends. Liked the words and rhythms of her writing. How does Stein’s remarkably individual voice, particularly her abandonment (or downplaying) of narrative for the sound of individual words and phrases, come across in Thomson’s music, and vice-versa? VT said you didn’t have to illustrate GS in music, only set the text clearly. Why is BMOP not using an all-black cast? No reason to follow the first all-black cast. Nothing “black” in text or music except perhaps the hymns, and they were in all-Protestant churches. All-black was in 1934 a very good political-publicity decision. It worked on many levels. See Stephen Watson’s book, Prepare for Saints. How do you think the opera’s story of 16th-century Catholic Spanish saints will be heard today? Recording is part of the Foundation’s support of this performance. All three VT operas are to be given new productions with recordings. BMOP already has a fine all-Thomson disk, including the Three Tone Pictures, one of his least-known scores. Not at all in the minimal style of Four Saints, Mother of Us All, etc. He did have another, much more chromatic and dissonant language. Is there a place for Four Saints in the operatic canon? Saints has a considerable place in the 20th-century operatic canon. The Watson book understands the how and whys of this. I see that you have recorded several CDs with Gil Rose and the Boston Modern Orchestra Project. Could you describe what it’s like to work with them? No exaggeration: Gil Rose has a splendid ensemble and is the most efficient planner of a recording schedule in USA. Look at the number of discs. Let me refer you to the preface article in Four Saints’ new score, MUSA edition. Wiley Hitchcock was the authority on American music and this long study was his final work. Carol Oja teaches at Harvard and was Wiley’s star student. Her book on American music in the ’20s, Making It Modern, can’t be beat. Tickets: General $20-$50/Students $15. To reserve seats now, contact BMOP at bmop.org or 617.585.1260. Tickets are also available through the Jordan Hall box office and tix.com.